Updated Thursday March 7, 2019 by South Williamson Softball. All new for Spring 2019, we are rolling out our first-ever Parent Gear Store! South Williamson Softball has partnered with our LOCAL uniform vendor, Jones & Lang, to custom-create an online store that will allow you to purchase parent gear items which will coordinate with your child's softball team. You have the option to personalize the back of your gear with a Name and Jersey #. Make sure you check for accurate spelling, as all orders are non-refundable.​​​ CONTACT YOUR DAUGHTER'S COACH FOR JERSEY # if you are unsure. You may ONLY order gear through this web-based store. Orders submitted by email, called in to Jones & Lang, submitted to coaches, etc. will not be accepted. 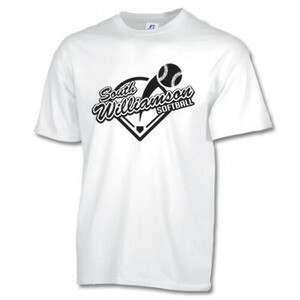 Although shirts on the store site are all white, Fan Gear shirts WILL COORDINATE with your child's Softball team! (For example, if the team jerseys are red with white lettering, all parent gear (even hats/visors!) will coordinate with those colors). ​ PARENT GEAR WILL BE DELIVERED WITH YOUR CHILD'S UNIFORM! !